I spent the first twenty-seven years of my ministry in Christian education. During those years I learned to love, appreciate, and respect those who teach preschool and grade school age kids. These unsung heroes do more for the cause of Christ than most people ever realize. I’ve often referred to those who teach children as under-painters. I learned about underpainting from my mother-in-law who is an artist. She explained to me that an artist must envision what a painting will look like and then begin by applying an initial layer of paint to the canvas that will accentuate and more clearly define the colors that are applied later. Like an artist, those who teach children brush the foundational truths of God’s story across young lives. Their work makes it easier for parents and other teachers to add their brush strokes to the canvas — specifically those brush strokes that add the detail that helps children develop a more complete picture of God. 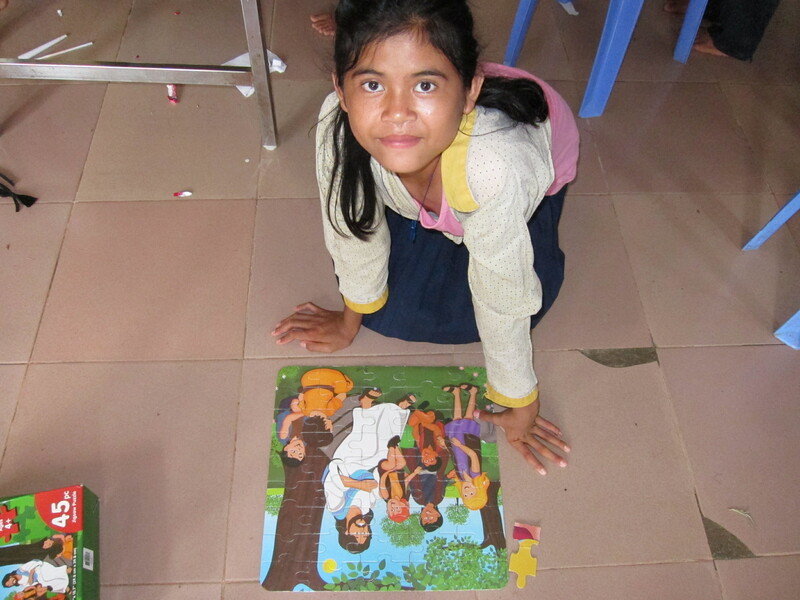 Our team of ladies have done quite a bit of underpainting this week in Cambodia. For the past several days they have lovingly brushed basic truths about God and His love across blank canvases that have the potential of becoming great masterpieces. Steve Hyde and his staff are doing a fantastic job of helping the children at the Imparting Smiles orphanage to gain an increasingly clearer understanding of Jesus and His love — one careful brush stroke at a time. They are also teaching the children in the surrounding slum neighborhoods the story of Jesus. This week approximately one-thousand kids attended the Vacation Bible School we hosted at the Imparting Smiles orphanage. Almost nine-hundred of these kids came from the surrounding neighborhoods and are from Buddhist families. For many of these kids, events like this are their only opportunity to hear about Jesus. 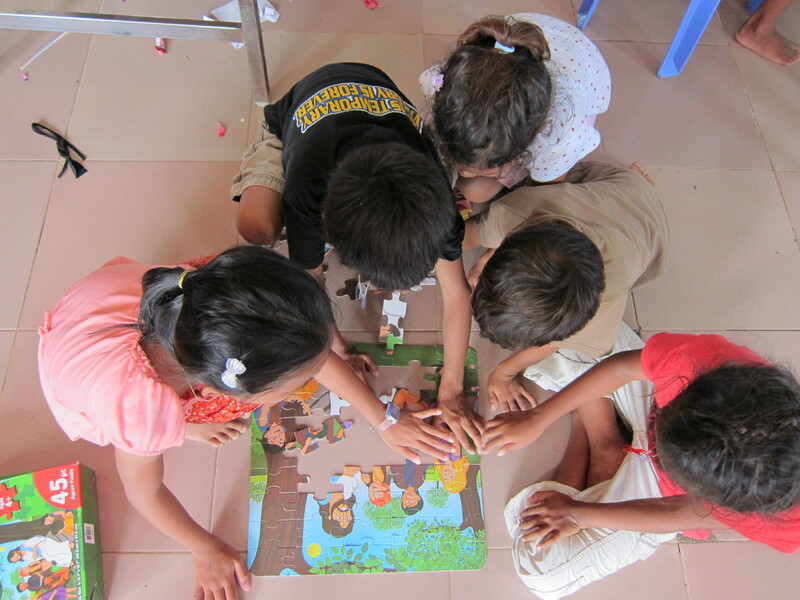 This afternoon I watched as several kids worked together to complete a puzzle of Jesus surrounded by children. As the kids added each piece to the puzzle the image of Jesus became increasingly clearer until it was finally complete. As I watched the kids work on the puzzle, I thought about what we have done here this week. Our team essentially added another piece to the puzzle. The kids who attended our Vacation Bible School this week understand a little more about Jesus than when they first arrived. And, as Steve and his staff and other short-term teams work with these kids, more pieces of the puzzle will be added until the kids understand the truth about Jesus and why He came. These kids are learning about God’s love for them one piece at a time. Steve and his staff understand that it will take lots of time and patience for the picture to become clearer for these kids — and they are committed to adding the detail one piece at a time.